At the XIII World Forestry Congress, the major international forestry event of 2009, one full day will be entirely devoted to strengthening your global business networks. The set-up will be a one-to-one meeting round arranged in a dynamic, business-on-the-table environment. At the XIII World Forestry Congress, a new vision of forest-dependent business clusters will be elaborated. Are you ready to share challenges and opportunities, what works and what does not? In the run-up to the event, we shall be meeting on an electronic forum, an informal space for exchanging presentations, experiences and views. 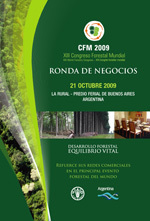 In preparation for Copenhagen 2009, the XIII World Forestry Congress invites the global forest community to a Forum on Forests and Climate Change, a unique occasion for debate which aims to produce a recommendation of a technical nature, which will be presented to the UNCCC COP 15. 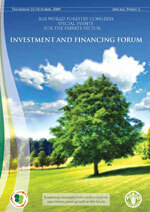 The XIII World Forestry Congress is organizing a Forum on Forests and Energy. The Forum aims to debate all of the issues surrounding the development of bioenergy and the potential role of wood, thereby including technological and economic aspects, as well as the likely social and environmental impacts. The Forum also aims to assist forestry policy makers, providing informed inputs towards the development of policy mechanisms based on a solid and shared technical understanding.